For its third season, the Coopérative-Collection Cérès Franco gives carte blanche to Jean-Hubert Martin, who selected about 280 pieces from the collection, in addition to several others from the Daniel Cordier collection, for the exhibition L’Internationale des Visionnaires. Martin invites us to a playful exploration through an itinerary that favours a spontaneous approach to the artworks. A mischievous nod at revolutionary songs, the title of the exhibition evokes the cosmopolitan and eclectic nature of the collection put together by Cérès Franco. When this Brazilian collector opened her gallery L’Œil de Bœuf in Paris in 1972, the Cold War was bringing to the French capital a stream of artists, chased from communist regimes in Europe, Asia and Latin America and who found in Paris a safe haven of expression. “The gallery L’Œil de Bœuf was a melting pot of artists from all over the world, and Cérès Franco was its queen”, writes Martin. “Painters of every possible origin gathered around the fiercely energetic hostess of this haven of creative freedom to develop new and daring ideas about painting and the depiction of human nature and its pleasures, pains and violence”. Based on the idea that the act of looking is too often subordinated to historical knowledge, to the point of overlooking the works themselves, the exhibition favours free exploration and invites the visitors to solicit their own sense of observation and to ask themselves: “what are we looking at”? Following a strategy akin to a game of dominoes or to the structure of a counting rhyme, the set-up is organised as a series where each work is determined by the one that comes first and anticipates the one that comes next, in an interplay of thematic or formal affinities. The exhibition will be punctuated by a number of monographic ensembles (Chaïbia, Roman Cieslewicz, Manuel Mendive Hoyo,…). Far from a traditional museum set-up, this focus on association, decompartmentalization and on an arrangement that does not follow a historical order is more akin to that of a private collection, where times and genres are readily juxtaposed as a reflection of a plural and evolving taste. No special knowledge about art history is needed here; by bringing together famous artists and unknown ones in no particular hierarchical order, the exhibition wants to be open to everyone and lays the emphasis on the works and on the viewers’ active involvement in the playful identification of differences and similarities. 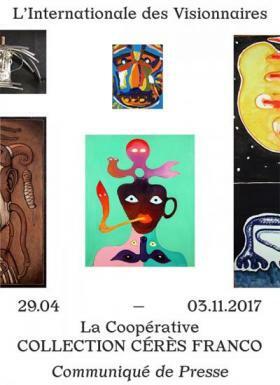 Artworks and curiosities from the donation of gallery owner and collector Daniel Cordier, stored since 1999 at the Abattoirs de Toulouse, will accompany the exhibition. Paintings by Dado, Combas, Chaissac and Schröder Sonnenstern, along with Nedjar’s puppets, will act as a counterpoint to the pieces of the Cérès Franco collection. This loan will also enable interesting comparisons between two collections that are now firmly rooted in the territory. In Montolieu, a close collaboration between the Musée des Arts et Métiers du Livre and the Cérès Franco collection has led in 2017 to the development of a joint project devoted to an artist who will be presented in both venues: Pierre Bettencourt (1917-2006). The Musée des Arts et Métiers du Livre will invite the public to discover the written and artistic production of this writer, typographer, publisher, traveller, painter and creator of unique and poetic worlds, between magic and dream. As a continuation of the exhibition, a rich programme of activities (events, talks, workshops with artists) has also been developed in order to raise awareness about different aspects of the collection. Some of our workshops and visits/talks are specially targeted at school and pre-school audiences from the Occitanie region. A booklet will be published on the occasion of the exhibition.